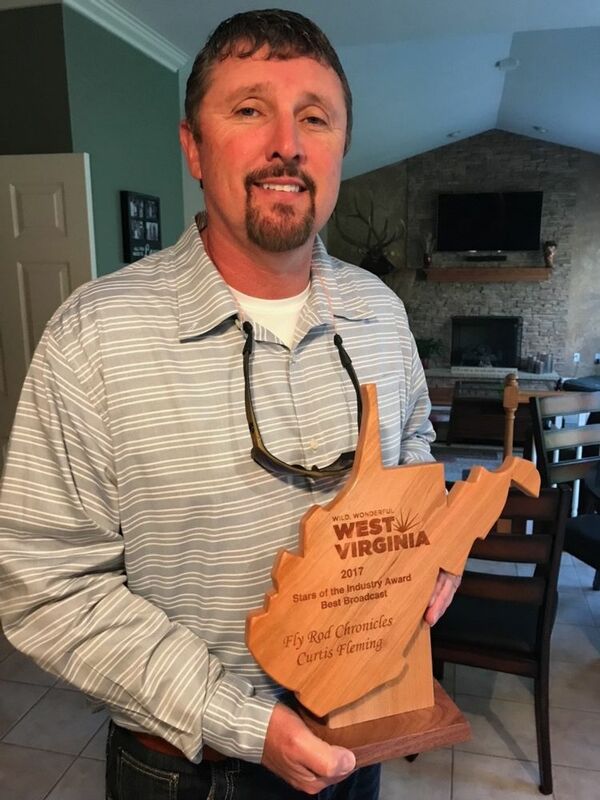 Bridgeport’s Curtis Fleming and his globally-televised fly fishing show, “Fly Rod Chronicles,” has been recognized by West Virginia Tourism for the best West Virginia broadcast. Announced recently at The Governor’s Conference on Tourism, the award recognizes Season 6 of the show which aired this calendar year. The accolade tops off a banner year for the show – a year when Fleming, a 1984 graduate of Bridgeport High School, turned 50. “We completely went crazy and overshot that year and had some incredible shows,” he said. It’s also fitting that the show, which airs weekly on the Outdoor Channel, featured some incredible West Virginia scenery and relayed some inspiring stories about the Mountain State. “A very special show was when we fished for ALS,” said Fleming about FRC Episode 74 which captures Fleming and his friend Bill Sumner throwing flies to bring awareness to Amyotrophic Lateral Sclerosis, also known as Lou Gehrig’s Disease. “His wife had been battling ALS and our goal was to raise money for the cure of the disease,” Fleming said. The episode features a weekend at Harman’s Luxury Log Cabins, a trout stream treasure along the North Fork of the South Branch of the Potomac River, tucked into the Dolly Sods Wilderness and flanked by the Allegheny Mountains. Episode 78 was filmed shortly after the June 2016 flooding in the southern part of the state. The show includes footage of a recently ravaged Greenbrier River and the fortitude of our neighbors to the south. The veteran featured in the show, Wes Phillips, was also treated to a Cabela’s shopping spree and Governor Jim Justice, owner of The Greenbrier, shared some first-hand accounts of the flood, as did various flood victims. Other episodes airing this year included those showcasing some local football greats – including Bridgeport’s own Indian football team. 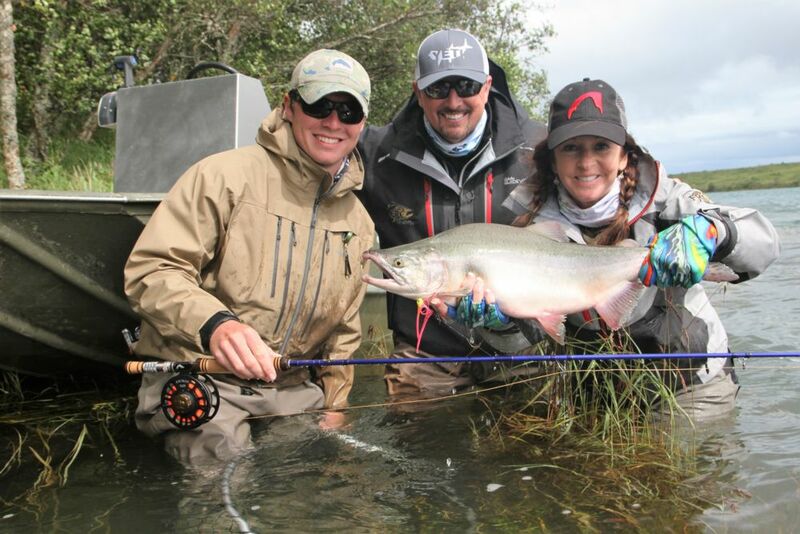 That outing was captured in Episode 71 and titled Back to the Basics – including basic information about fly fishing. 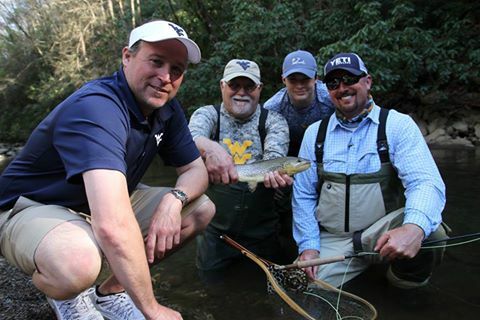 The other football-related show featured West Virginia University Coach Dana Holgorsen and some family members fishing at Glade Springs Resort. 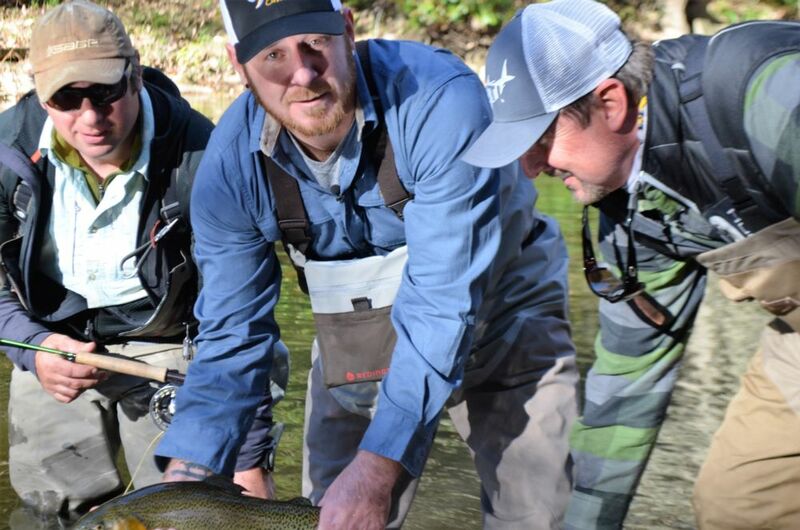 Fleming got to play coach to Holgorsen’s first fly fishing experience. 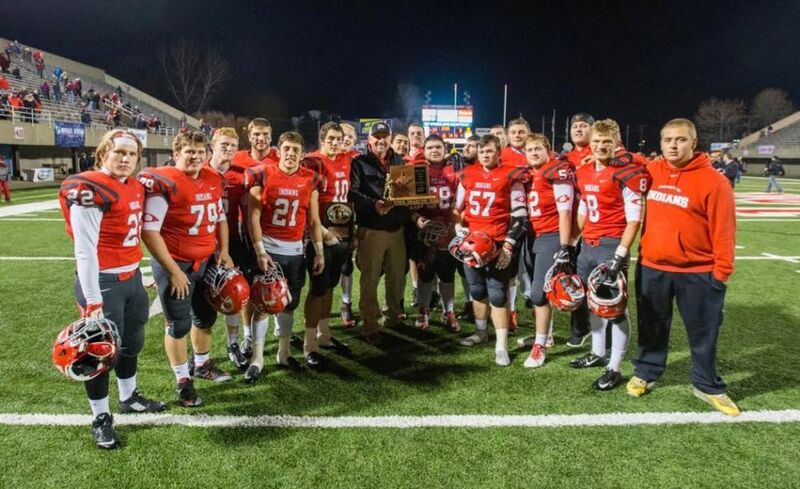 It was a double win for the coach, Fleming said. “After we went fishing with him, his whole entire football season turned around and he got a new contract to stay here in West Virginia,” he said. Another Season 6 episode that showed off Almost Heaven was an excursion on Stonewall Jackson Lake; one which yielded a world record. Fleming said he’s enjoyed reflecting on the past year of shows. “Looking back, it was a banner year and it had very little to do with me,” he said. 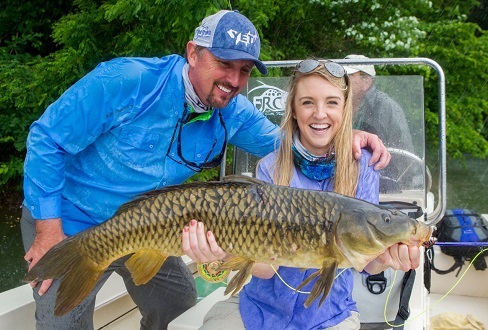 Fleming’s wife Shelly and their daughters Laken and Autumn are featured in some of the shows, as are some notable fishing guides and special guests. In addition to the West Virginia-themed shows, some took Fleming to far corners of the world. 2016 also brought Fleming an invitation to be inducted into the Fly Fishing Hall of Fame and an ambassadorship with Cabela’s – naming the Bridgeport native an expert fly fishing ambassador. Fleming and his family lived in Winchester, Va. for several years. 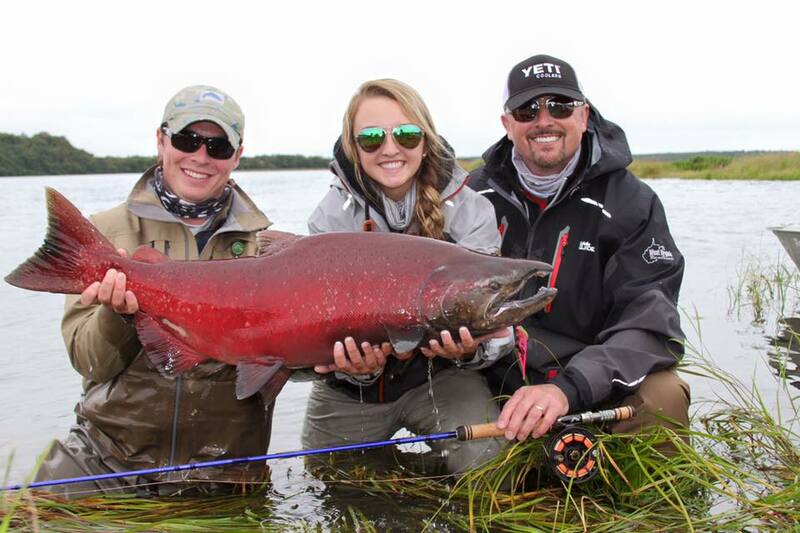 In 2012, he moved his family and show headquarters back to Bridgeport, where he first became hooked on fly fishing. Awards are great, Fleming said, but it’s what’s behind them that counts. Originally appears in Connect Bridgeport, written by Julie Perine.